In its 10-year Defense Program Guidelines, Tokyo said it will buy 42 of the stealthy F-35Bs, which are designed for short-run take offs and vertical landings. Those planes will be available for deployment aboard two flat-top ships, the JS Izumo and JS Kaga, which at more than 800 feet long and displacing 27,000 tons are the largest ships in the Japanese fleet. The Izumo and Kaga have been carrying helicopters designed for anti-submarine warfare since entering service over the past three years. They will need to have their decks reinforced to accommodate the heavier F-35Bs, as well as the heat and force from the jets' thrusters when they land vertically. Japan will also increase its order for F-35A jets, which take off and land on conventional runways, to 105, the government said. Forty-two of those jets are in service or were part of earlier Japanese orders. Those planes will replace the Japan Air Self-Defense Force's aging F-15J fighters. The purchases will be spread over 10 years, with 27 of the F-35As and 18 of the F-35Bs to be acquired, as well as the two warships to be refitted, in the first five years. Total spending over the first five years is pegged at $282.4 billion and will include creating cyber defense and naval transportation units that operate across Japan's three military branches, the Ground, Air and Maritime Self-Defense Forces. All of Asia is and will always be scared shitless of the Japanese. They better upgrade their birthrate pronto, or maybe they’ll have robots manning these ships. They did have the BAKA bomb. Kaga and Izumo (also spelled Idzumo), which are named after Japanese provinces, might give American WWII veterans a sense of déjà vu. The aircraft carrier Kaga took part in the attack on Pearl Harbor but was sunk half a year later at Midway. In 1905, Izumo, a cruiser, took part in the Battle of Tsushima Strai in which the Japanese wiped out the Russian Baltic Fleet. In 1937, it was stationed in Shanghai when a Chinese bomber that was attacking it accidentally dropped its bomb on a nearby residential area killing nearly 1,000 people and making headlines around the world. In his memoir Way of a Fighter (New York: Putnam's, 1949) General Claire L. Chennault, who was advising the Chinese air force at the time, claimed that Izumo was sunk by a Chinese bomber shortly afterwards. However, it returned to Japan and served as a training ship before being sunk by US naval aircraft in July, 1945. Can the Soryu, Hiryu and Akagi be far behind? 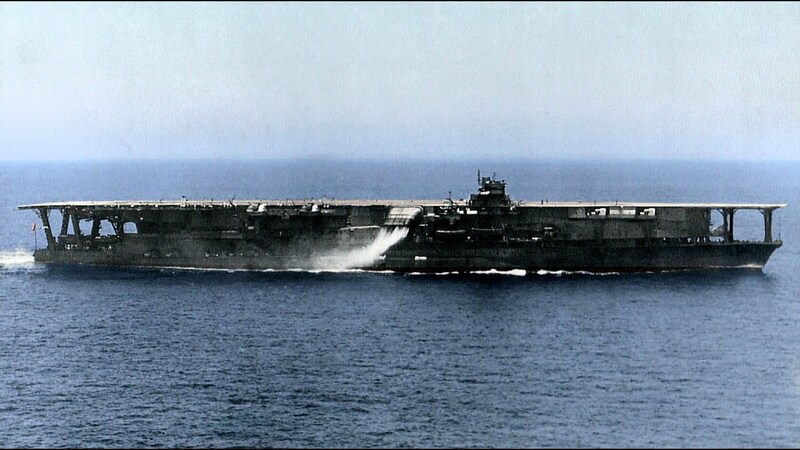 Look for the Japanese to go big on their next carrier, something approaching the Forrestal or Kitty Hawk class. Another land lubber talking about "killing" a carrier. That term "kill" doesn't apply to naval warfare. One missile will not "kill" a carrier. To "kill" a carrier you have sink it. To sink a carrier requires under water hull damage. This requires a torpedo(s) or mines, not a missile(s). It takes two torpedo hits to sink an FFG weighing 5,000 tons. A carrier is 20 times that size so it would take 40 torpedoes to SINK a carrier. The biggest threat to carriers are the lack of naval repair facilities and dry docks, not missiles. If a carrier limps back to port and there is no place to repair it then that is a soft kill. Thanks to Free Traitors our industrial base is not capable of sustaining a protracted naval war. Thanks Free Traitors. Actually the latest Jap aircraft were every bit as good as ours but they came too late. KI-84 and N1K2 being the two best examples. Nuclear carries are waste of money. Build two conventionals for one nuke. How about a 10 kT warhead half a mile away? If Navy ships are shooting nukes at each other then the world is a cinder and what happens at sea is irrelevant. No American President is going to kill millions of civilians over an attack on a purely military target. Nuking carriers in port would be a no-no. 2000 miles at sea, with zero collateral damage? Thats different. Listen why would ships even have conventional weapons? The Jap Zero, unrivaled among carrier based fighters at the start of the war, weighed about as much as your SUV and produced 940 horsepower. If you can imagine driving an SUV with 940 hp, that’s what handling the Zero was like. They zero had no sealing fuel tanks and no pilot armor. They sucked, really. I read Samurai! by Sakai and he had nothing but admiration for the toughness of USN planes even the lowly f4f wildcat.